Persistence Market Research’s latest publication titled ‘Bromelain Market: Global Industry Analysis (2012 – 2016) and Forecast (2017 – 2025)’ studies the global bromelain market for the period from 2017 to 2025 and provides an in-depth market assessment along with recommendations for players operating in the global market. The report studies the overall market approach including manufacturer strategies as well as the new production technologies being introduced in the global market for bromelain across different regions. Key differentiating strategies of bromelain manufacturers are also highlighted for the benefit of the readers. The global production and consumption cluster of bromelain along with key buyer analysis across the assessed regions is an important component of this report. The report begins with a brief yet comprehensive executive summary covering the market overview, market analysis, and our recommendations; followed by an introduction to the global bromelain market covering the market definition and market taxonomy. The market dynamics section follows next, where the macroeconomic factors anticipated to impact revenue growth of the global bromelain market are highlighted. This section also includes a market opportunity analysis, information on key regulations in the global bromelain market, and the relevance and impact of forecast factors on the performance of the global bromelain market over the assessment period. The next section presents the global bromelain market analysis and forecast. This includes market volume analysis, market size in US$ Mn and forecast, absolute $ opportunity analysis, pricing analysis, the global bromelain market value chain, profitability margins, and a list of active global market participants. The next few sections present the global bromelain market forecast by product type, application, and region. These sections include a historical forecast for the period 2012 to 2016, current and estimated market size (US$ Mn) and volume (MT) forecast, and a market attractiveness analysis. The next set of sections focus on the regional bromelain markets and present a detailed forecast and regional market information. These sections include an introduction to the regional bromelain markets, regional market dynamics (drivers, restraints, and trends), historical and current market size and volume forecast by country, product type, and application, impact analysis of regional drivers and restraints, and a market attractiveness analysis by country, product type, and application. The last important section of the report features the competitive landscape of the global bromelain market. This section is intended to serve as a dashboard of the key player ecosystem of the global bromelain market. Some of the top companies operating in the global bromelain market are profiled in this section. 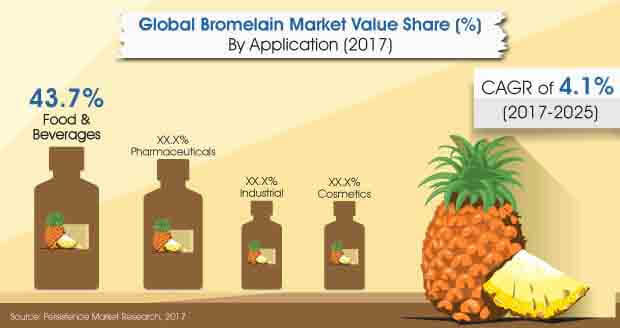 Information such as company overview, key financials, business and growth strategies, and recent market developments will help the reader study the business operations of these companies and understand the market structure of the global bromelain market in detail. A comprehensive SWOT analysis of these top companies is also included for the readers’ benefit. Persistence Market Research methodology of research is a combination of extensive primary and secondary research – secondary research to gather all the pertinent information on the global bromelain market and primary research to validate the data gathered from secondary research. By triangulating primary and secondary research data along with our independent analysis, we offer near accurate market estimations and deep market insights capable of effecting timely and informed business decisions. Derived from the pineapple plant, the bromelain enzyme finds various applications across different end-use industries. At the industrial level, bromelain is used to digest proteins. The proteolytic nature of bromelain finds application in the F&B industry where bromelain is largely used as a meat tenderizer. With added benefits such as anti-inflammation and immunity boosting properties, bromelain is being increasingly used in dietary supplements. Bromelain also finds application as a viable solution to several energy and resource consuming processes in industries such as leather and paper processing. The meat industry is a large part of the global food & beverages sector and there is a continuous and rapidly rising consumer demand for processed meat and ready-to-cook and ready-to-eat meat dishes, owing to the ease of consumption of these ready meat food products. Bromelain is in great demand in the F&B industry to tenderize red meat. Traditional methods of meat tenderization using the process of marination is time consuming and requires a significant amount of resources. The Bromelain enzyme – owing to its inherent properties to tenderize meat – helps reduce post process preparation time and reduces production costs significantly. This is anticipated to boost market demand for the enzyme in the coming years. The Food & Beverages and Pharmaceuticals industries have the largest applications of bromelain for several processes. Both these segments are collectively expected to hold more than 85% of the global bromelain market share throughout the forecast period 2017 – 2025. Increasing application of bromelain in the bakery, meat, and brewing industry is likely to boost revenue growth of the F&B segment during the period of assessment. The Food & Beverages segment is estimated to represent an absolute $ opportunity of US$ 11.6 Mn in 2017 over 2016, and an incremental $ opportunity of US$ 129.6 Mn between 2017 and 2025. The Pharmaceuticals segment is estimated to represent an absolute $ opportunity of US$ 10.0 Mn in 2017 over 2016, and an incremental $ opportunity of US$ 102.9 Mn between 2017 and 2025. Rising demand from the household care and meat industries in North America: The detergent industry in North America is the largest consumer of enzymes and the household care industry extensively utilizes enzymes such as bromelain in various products. The meat industry in North America is on an upward growth trajectory, owing to increasing consumption of meat products by the population. Bromelain being the most sought after meat tenderizing agent is in great demand in the F&B industry across North America. A trending development in this region is the adoption of bromelain in teeth whitening products. Oral care product manufacturers are now including bromelain-added products in their offerings. Increasing demand from the animal feed market in Latin America: Brazil is the leading consumer of poultry feed and feed additives in Latin America. There is a growing demand for poultry meat in the region. The carbohydrate and protein enhancing solutions for the animal feed market are driving the growth in demand for enzymes such as bromelain. Addition of the bromelain enzyme improves the digestibility of cereal containing feeds. Also, Brazil and Argentina are the two largest consumers and exporters of meat in Latin America and consequently, there has been a steadily increasing demand for bromelain across the region. Rising consumption of bromelain supplements and increased usage in the cosmetics industry in Europe: Bromelain is widely used as a health supplement in Germany, and is used to treat inflammation and swelling of the nose and sinus after an injury or surgery. Also, top players in Europe’s cosmetics industry are developing innovative products by including bromelain, as bromelain helps in treating acne, wrinkles, and dry skin. It also helps in post-injection bruising and swelling. Growing demand for bromelain in the textile industry in Asia Pacific: There is a growing demand for enzymes in textile processing across the APAC region, as enzymes allow the development of environmentally-friendly technologies in fiber processing and strategies to improve the quality of the final product. Continuous product and technological innovation in the textile industry in the region is leading to a rapid increase in the demand for enzymes like bromelain. Bromelain also finds application as a skin recovery agent, protecting the skin from damage occurring during cosmetic and dermal surgeries. Demand for bromelain from APAC’s pharmaceuticals industry is currently on an upswing. Growing demand in the bakery industry in the Middle East & Africa: The bakery industry in the MEA region is steadily growing, especially in countries such as Turkey and Bulgaria. Bromelain finds wide application in the bakery industry to increase the rate of reaction, improve dough relaxation, prevent dough re-shrinkage, and reduce the production time. Bromelain is also used in ready-to-eat and frozen food products and a growing consumer demand for these food products is boosting regional market demand for bromelain. Nanning Pangbo Bioengineering Co., Ltd.
Guangxi Nanning Javely Biological Products Co., Ltd.